BACKGROUND: Low back pain (LBP) patients with related leg pain have a more severe profile than those with local LBP and a worse prognosis. Pain location above or below the knee and the presence of neurological signs differentiate patients with different profiles, but knowledge about the prognostic value of these subgroups is sparse. 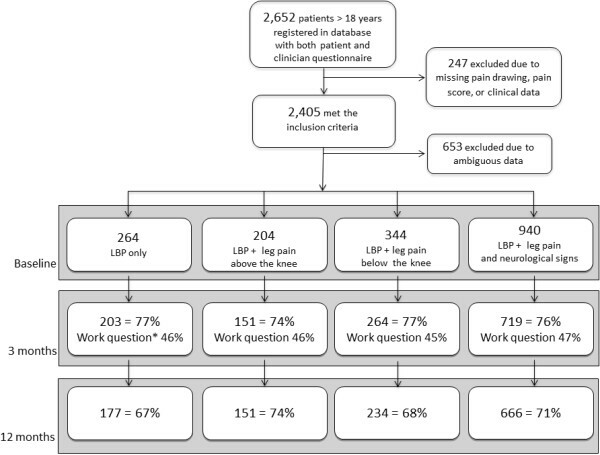 The objectives of this study were (1) to investigate whether subgroups consisting of patients with Local LBP only, LBP + leg pain above the knee, LBP + leg pain below the knee, and LBP + leg pain and neurological signs had different prognoses, and (2) to determine if this was explained by measured baseline factors. METHODS: Routine clinical data were collected during the first visit to an outpatient department and follow-ups were performed after 3 and 12 months. Patients were divided into the four subgroups and associations between subgroups and the outcomes of activity limitation, global perceived effect (GPE) after 3 months, and sick leave after 3 months were tested by means of generalised estimating equations. Models were univariate (I), adjusted for duration (II), and adjusted for all baseline differences (III). RESULTS: A total of 1,752 patients were included, with a 76% 3–month and 70% 12–month follow-up. Subgroups were associated with activity limitation in all models (p < 0.001). Local LBP had the least and LBP + neurological signs the most severe limitations at all time-points, although patients with neurological signs improved the most. Associations with GPE after 3 months were only significant in Model I. Subgroups were associated with sick leave after 3 months in model I and II, with sick leave being most frequent in the subgroup with neurological signs. No significant differences were found in any pairwise comparisons of patients with leg pain above or below the knee. It is widely believed that the identification of homogeneous subgroups of low back pain (LBP) patients is important for the optimal prediction of prognosis and care. [1, 2] LBP patients with leg pain are reported to differ from those with local LBP only, both in terms of general clinical characteristics and prognosis. However, patients with leg pain do not form a single homogenous group and the association between leg pain and prognosis is quite weak. [3–5] More detailed examination of subgroups within the leg pain population [6, 7] may lead to identification of stronger prognostic indicators. Differentiation between leg pain above and below the knee and leg pain with and without neurological signs were suggested as diagnostic tools more than twenty years ago , but still there is sparse knowledge about their clinical relevance for prognosis or as treatment effect moderators. A recent systematic review of the impact of LBP-related leg pain on outcomes concluded that leg pain appears to be associated with worse outcomes, but highlighted the lack of evidence concerning leg pain subgroups. Furthermore, the reviewed studies did not allow the authors to assess whether the presence of leg pain was an independent predictor of outcome. The objective of the current study was to investigate whether the four QTF subgroups were associated with activity limitation after 3 and 12 months, global perceived effect after 3 months, or sick leave at 3 months follow-up in patients referred to a secondary care outpatient department, and whether observed associations could be explained by differences in measured baseline characteristics. The setting and baseline data collection have been previously reported in full detail. In short, data collection was part of the daily clinical routine in a secondary care outpatient department seeing approximately 9,000 new spinal pain patients per year. At the first visit to the department, patients completed a questionnaire on a touch screen in the waiting area prior to seeing a clinician. Clinicians entered the results of a core set of clinical variables when examining the patient or following the consultation. Both patient-reported and clinician-reported data were entered directly into the Department’s electronic registry, the SpineData database (Regional Ethics Committee Project ID S-200112000-29). Patients were invited to complete a follow-up questionnaire after 3 and 12 months either electronically or in paper format. Only patients who gave informed consent for their data to be used for scientific purposes were included in the study. All patients aged 18 years or older who were referred with LBP as their main complaint and were seen in the Department between 10 October 2010 and 30 November 2011 were potential participants. Additional inclusion criteria were that data needed to be available from pain intensity scales, a pain drawing, and from the clinician’s neurological examination in SpineData. ’it takes a long time before it settles again’ [17, 18]). Work participation was assessed as days on sick leave (days off work during the preceding 3 months due to LBP among patients who had conventional employment – were not unemployed, a student, retired or receiving a pension). Pain-related fear of movement was measured using NRS 0–10 scales (proportion with a total score on two screening questions from the Fear Avoidance Belief Questionnaire equal to or above 14). This threshold was also derived in an unpublished study in our patient setting based on a comparison with a primary care score threshold (mean plus 1 standard deviation) on the physical activity subscale of the Fear Avoidance Belief Questionnaire. The four subgroups were formed using the following definitions. 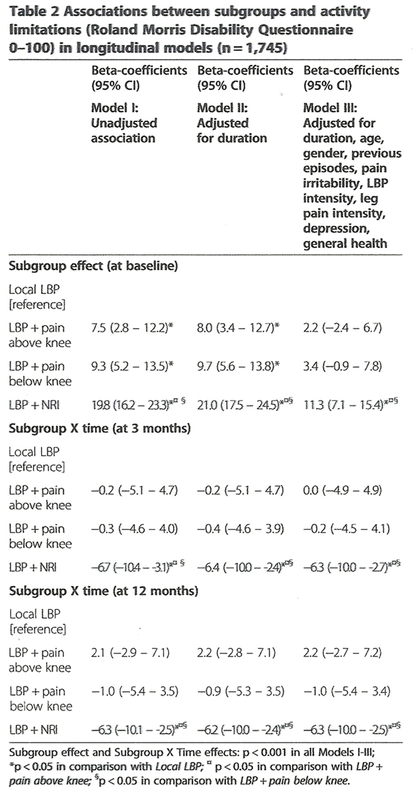 Local LBP only: The pain drawing only included local LBP, and the worst leg pain intensity in the preceding 14 days was zero (0–10 scale). LBP + pain above knee: The pain drawing included pain in the anterior or posterior thigh but no pain in the calf or feet, and the worst leg pain intensity in the last 14 days was one or more (0–10 scale). LBP + pain below knee: The pain drawing indicated pain in the calf and/or foot and the worst leg pain intensity in the last 14 days was at least one. a positive prone knee bend test combined with pain to the anterior thigh (Reverse Laségue Test). The term ‘signs of nerve root involvement’ should be considered a label given to patients fulfilling these criteria rather than a definitive diagnostic entity. If classification was unclear, for example a patient reporting leg pain intensity to be zero but indicating leg pain on the pain drawing, the patient was excluded from the analysis. Such ambiguous reporting was not necessarily due to inaccurate answers since the intensity scale asked about the last 14 days, whereas patients were asked to indicate ‘where your pain is’ in the pain chart. Sick leave was defined as the proportion of those in the working population at baseline (that is, not unemployed, a student, a housewife, retired or receiving a pension) who reported being on sick leave due to LBP at the time of the 3–month follow-up. Data on sick leave were not available at 12 months. Baseline characteristics were presented as proportions with 95% confidence intervals (95% CI), means with standard deviations (SD), or medians with interquartile ranges (IQR) depending on the data distribution of the variable. An association between subgroup and activity limitation was primarily tested in a longitudinal model using population averaged generalised estimating equations (GEE) (family Gaussian, link identity, correlation structure exchangeable) which take into account that measures of activity limitation were repeated. The subgroup variable was introduced as a categorical variable in the analysis with dummy variables that had local LBP only as the reference category. In addition, absolute subgroup differences at each follow-up time point were tested for statistical significance in generalized linear models. The associations with global perceived effect and sick leave were tested by means of GEE (family binomial, link function logit). ‘Success’ on global perceived effect being defined as ‘much better’ or ‘better’ and all other categories as ‘failure’. Associations are presented as unadjusted β-values/Odds ratios with 95% CI (Model I). In addition, estimates adjusted for duration of LBP at the first visit (Model II), and adjusted for duration and factors differing between subgroups at baseline (Model III) were calculated. Only covariates with p < 0.1 were kept in Model III with global perceived effect and sick leave as the outcomes because the number of cases was too low to allow for a larger model. Missing values on baseline variables used as covariates were imputed using multiple imputations by five chained iterations (logit for binary, mlogit for categorical, and predictive mean matching for continuous variables). Seventy-five per cent of patients had no missing data, and most imputed variables had less than 10% imputed data. However, 17% were imputed for pain irritability and 10% for self-reported general health. Model I was mainly considered relevant to the setting of the study, since differences in duration between subgroups were regarded to be a consequence of referral patterns to the Department rather than related to the condition. Model II answered whether the four QTF subgroups were associated with outcome, and Model III investigated whether an observed association could be explained by differences in measured baseline characteristics. Episode duration was categorised by being split into 25% quartiles since it had a non-linear relationship with the outcome measures. All analyses were performed using STATA/SE 12.1 using ‘mi’ functions for estimations based on multiple imputations. A total of 2,652 LBP patients above 18 years of age were registered in SpineData within the inclusion period of the study (56% females, mean age 50 years). From these 2,405 fulfilled the inclusion criteria and 1,752 (55% females, mean age 50 years) could be classified in the pre-defined subgroups (Figure 1). Among those with LBP + NRI, 669 patients had more than one neurological sign. Of those with only one sign, 73 patients had only a positive straight leg raise, 45 had only reduced muscle strength, 135 had only altered sensation, and 18 had only impaired tendon reflexes. Follow-up after 3 and 12 months was completed by 76% and 70% respectively, but response rates relating to sick leave were lower (Figure 1). Non-responders did not differ significantly from responders on LBP intensity, duration, activity limitation, depression or fear of movement at baseline. However, non-responders at 3–months follow-up were more often male (48% vs. 43%) and were on average 1.4 years younger as compared with the responders (p < .05). These differences between responders and non-responders did not differ significantly between subgroups. Non-responders at 12–month follow-up were on average 3.3 years younger (p < .05), and did not differ significantly from responders on other baseline factors. Also, non-response to the sick leave question did not differ across subgroups. Patient self-reported characteristics are summarised in Table 1. Statistically significant differences across subgroups were observed for all measured baseline factors except fear of movement. Generally, those with Local LBP were the least severely affected and those with LBP + NRI had the most severe profile. The differences observed in duration indicated that patients with LBP + NRI were referred to the Department earlier than other patients, but even in that subgroup, many patients reported very long-lasting pain. Activity limitation from baseline to 12–month follow-up within the four subgroups is illustrated in Figure 2. Statistically significant associations were present between subgroups on change in activity limitation in both the unadjusted and adjusted analyses (Table 2). However, the residual variance was only slightly reduced by subgroups (R2 = .04). Patients with LBP + NRI improved more than other subgroups in pairwise comparisons, and the estimated effect of being in the LBP + NRI subgroup on the course of activity limitation was largely unaltered after adjusting for duration and other covariates. Looking at absolute RMDQ scores, the subgroup with Local LBP had the least activity limitation at all time points and the LBP + NRI the most (Figure 2). Pairwise comparisons of absolute RMDQ scores adjusted for duration (Model II) were all significant (p < 0.05) except that LBP + pain above knee and LBP + pain below knee did not differ significantly at any time point. In Model III, LBP + NRI differed significantly from Local LBP at 3–month follow-up. At 12–month follow-up, significant differences existed between Local LBP and LBP + pain above knee and between Local LBP and LBP + NRI. However a very small proportion of the variance in activity limitation was explained by subgroups (R2 = .02 for 3– and 12–month analyses). At the 3–month follow-up, 31% of the cohort reported to be ‘much better’ or ‘better’. This proportion varied across the subgroups from 23% in the LBP + pain below knee subgroup to 36% in the LBP + NRI subgroup. There were statistically significant associations between the subgroups and global perceived effect in Model I but the prognostic capacity in terms of AUC was low, and the association was not significant when duration was taken into account in Model II (Table 3). Therefore Model III was considered irrelevant. 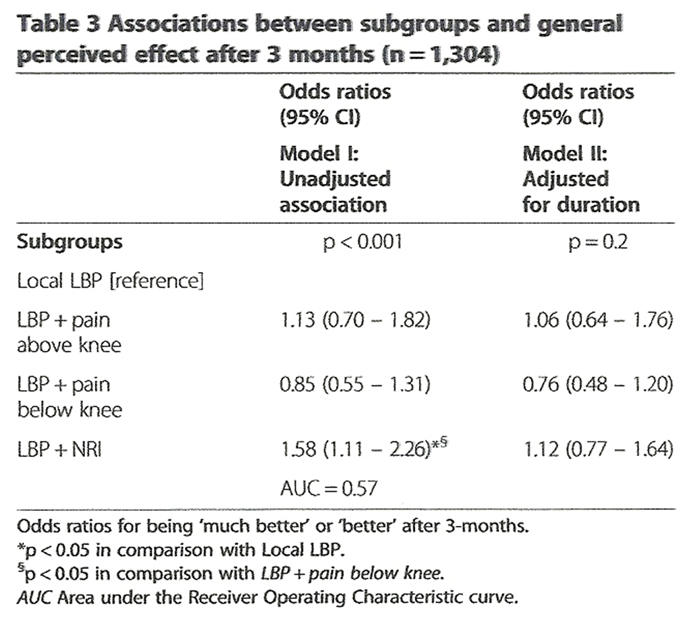 The LBP + NRI subgroup had higher odds of being ‘much better’ or ‘better’ as compared with the Local LBP and the LBP + pain below knee subgroups in pairwise comparisons (Table 3). At baseline 1,003 (57%) of the participating patients were in the working population (Local LBP only 64%, LBP + above knee 62%, LBP + below knee 54%, and LBP + NRI 56%. P = 0.03). At the 3–months follow-up 29% (95% CI: 25–33%) of these were currently on sick leave, with the distribution in the subgroups ranging from 19% in the Local LBP subgroup to 35% in the LBP + NRI subgroup (p = 0.02). A larger proportion of patients in the LBP + NRI subgroup were on sick leave at 3 months and subgroups were significantly associated with sick leave in model I and model II but not in model III (Table 4). This study investigated whether subgrouping of LBP patients based on leg pain patterns had any prognostic implications. Patients with LBP + NRI improved more than other subgroups on change in activity limitation but had a poorer outcome as measured by absolute RMDQ scores after one year. 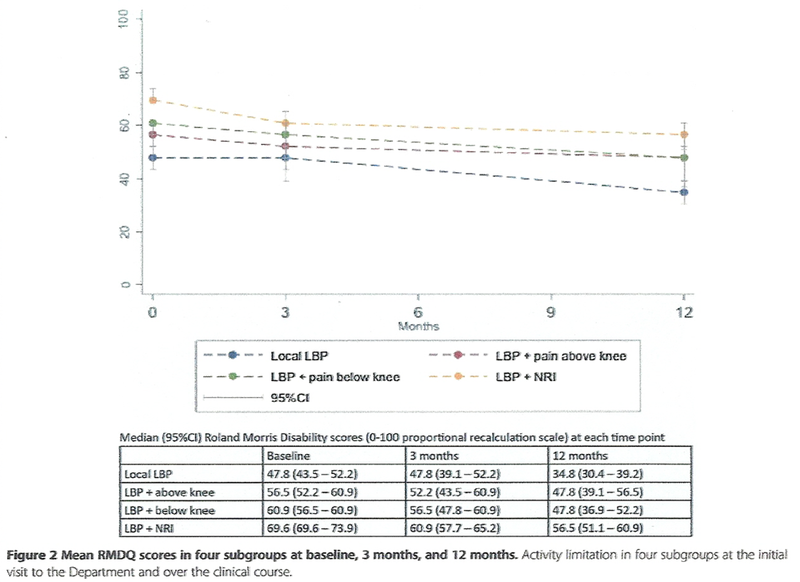 Patients with Local LBP, LBP + pain above knee, and LBP + pain below knee all had similar trajectories of activity limitation. This resulted in similar absolute RMDQ scores for LBP + pain above knee and LBP + pain below knee patients. In contrast, the Local LBP was the subgroup least affected by activity limitation both at baseline and after one year. There was no significant association between subgroups and global perceived effect above that which could be explained by differences in duration. For the outcome of sick leave, patients in the LBP + NRI subgroup had a larger risk of long-lasting sick leave at 3 months compared with patients in the Local LBP and LBP + pain above knee subgroups. The larger improvement in activity limitation within the LBP + NRI group was not explained by other measured baseline factors. Duration, age, gender, previous LBP episodes, pain irritability, LBP intensity, leg pain intensity, depression, and general health were all taken into account but differences on these factors between subgroups were not shown to be the reason for the different trajectories. Thus, the presence of neurological signs was associated with larger improvement, but at the same time a poorer outcome, and this is likely to be a direct effect of nerve root involvement. The finding that patients with neurological signs report better global perceived effect and poorer absolute outcome has been observed in previous studies that used unadjusted analyses. Those studies included patients from surgical departments  and a workplace setting. [11, 12] In a primary care cohort, which predictably had a shorter LBP duration than our secondary care cohort, Hill et al. 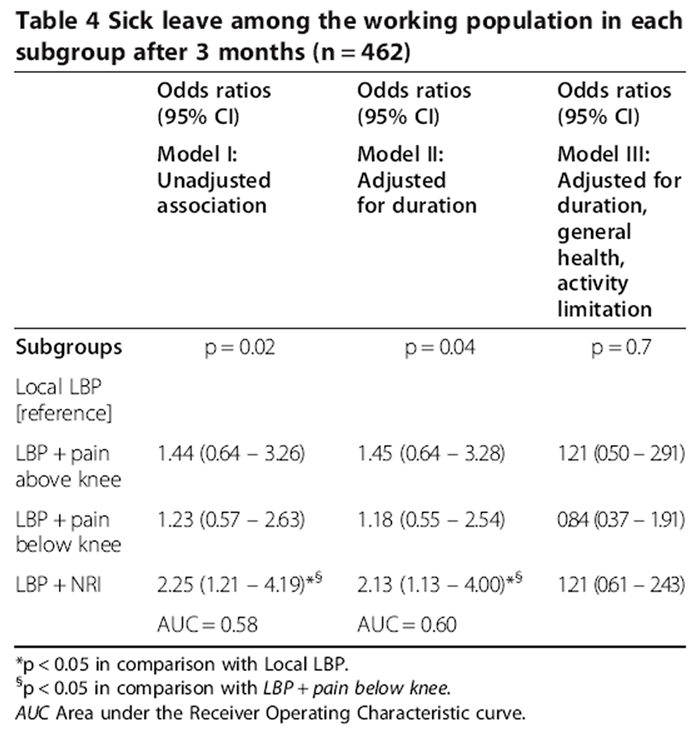 found that prognostic differences between subgroups with local LBP, LBP + pain above knee, and LBP + pain below knee were explained by other baseline characteristics. It may be that such baseline characteristics are important covariates early in the clinical course but our results highlight that the inclusion of neurological signs is more prognostically important than only distinguishing between pain above and below the knee, and we believe presence of the LBP + NRI subgroup is likely to be a central explanation for why our results differ from those of Hill et al. A strength of the current study is that data were collected prospectively from a near-complete cohort of people in routine care. We believe this strengthens the generalisability of our results to other chronic LBP populations. Furthermore, the sample size was adequate for the conducted analyses, and data were available that made possible analyses of outcomes across different domains of health. Lastly, the response rates of 76% and 70% at the two follow-up time points, that were very similar in all the studied subgroups, we consider to be acceptable for a clinical registry. The study also had limitations. The most important limitation from our perspective was the definition of nerve root involvement. Classification into the group with LBP + NRI required the presence of just one positive finding in the neurological examination, and the reliability of these findings in our clinical department, notwithstanding an ongoing quality assurance program, is unknown. A lack of such knowledge and less stringent procedures for data collection than are possible in clinical trials are inherent limitations of data from large clinical databases that were not collected for a specific research project. Moreover, for unknown reasons, answers to sick leave questions at follow-up were more often incomplete than other outcome measures. However, this did appear to affect subgroup differences. Overall, this simple QTF classification of LBP displayed an association with the outcome of activity limitation that was above what could be explained by other measured baseline characteristics, and the QTF subgroups were also associated with sick leave after 3 months when only duration was included as a covariate. Subgroup differences were most marked between Local LBP and LBP + NRI and sometimes these groups also differed from other groups. However, whether leg pain location was above or below the knee was not an important distinction for the outcome measures investigated. Despite the QTF classification displaying statistically significant associations at a subgroup level, it explained very little of the variance (2%) in the outcome activity limitation at an individual patient level and the predictive ability relating to sick leave was also low when measured by the AUC statistic. It is not uncommon in LBP that prognostic factors show statistically significant associations with outcome at a group level but little predictive value at an individual level  and there is no evidence for a single factor that substantially affects LBP prognosis on its own for all individuals. Also, investigating separate prognostic factors is a necessary step to inform more sophisticated modelling of multiple factors that may be more accurate for individuals. Hayden et al. classified prognostic research as a 3–step sequential process. Initially, factors that are associated with outcome are identified, then tested for their independent effect on outcome, and lastly prognostic pathways are investigated by mapping how prognostic factors, mediators and moderators interact and influence outcome. The current study would be classified as a second step investigation and suggests that leg pain and presence of neurological signs should be included in studying prognostic pathways. However, another potentially important result from prognostic research is the treatment implications of subgroup-targeted treatment. Classification tools such as the STarT Back Tool have shown that appropriate matching of treatment pathways to prognostic subgroups can result in better patient outcomes that are also cost-effective. It may be that the cost-effectiveness of LBP care can be improved by subgroup-focused treatment of patients, even if those groups, such as QTF subgroups, are not completely homogenous. Put another way, useful improvements in outcomes may result at a clinical population level, even if the predictability of outcome in individuals remains limited. The current study was unable to explore this as treatment was not targeted to the QTF subgroups, but the principle of subgroup-targeted treatment is a promising direction for research. In summary, the QTF classification was a prognostic factor at a group level but not very accurate at predicting outcome for individual patients. Therefore this classification should be considered as a factor to be included in multi-factor predictive models, though probably without the distinction of pain above and below the knee. Also, it remains to be investigated whether the QTF classification is a potential treatment effect modifier and its role as a predictor and/or treatment effect modifier may qualify it to be included in multi-dimensional subgrouping tools. The authors want to thank participating patients and clinicians at the Spine Centre of Southern Denmark who took part in the data collection. Peter Kent is partially supported, and Alice Kongsted and Tue Secher Jensen are fully supported, by grants from the Foundation for Chiropractic Research and Post Graduate Education, Denmark. Do primary-care clinicians think that nonspecific low back pain is one condition? Foster NE, Hill JC, Hay EM. Subgrouping patients with low back pain in primary care: are we getting any better at it? Can we predict poor recovery from recent-onset nonspecific low back pain? A systematic review. Will this patient develop persistent disabling low back pain? Dunn KM, Jordan KP, Croft PR. Contributions of prognostic factors for poor outcome in primary care low back pain patients. Spitzer WO, LeBlanc FE, Dupuis M.
Scientific approach to the assessment and management of activity-related spinal disorders. A monograph for clinicians. Report of the Quebec Task Force on Spinal Disorders. Schafer A, Hall T, Briffa K.
Classification of low back-related leg pain–a proposed patho-mechanism-based approach. Kongsted A, Kent P, Albert HB, Jensen TS, Manniche C.
Patients with low back pain differ from those who also have leg pain or signs of nerve root involvement - a cross-sectional study. Selim AJ, Ren XS, Fincke G, Deyo RA, Rogers W, Miller D, Linzer M, Kazis L.
The importance of radiating leg pain in assessing health outcomes among patients with low back pain. Results from the Veterans Health Study. BenDebba M, Torgerson WS, Long DM. A validated, practical classification procedure for many persistent low back pain patients. Atlas SJ, Deyo RA, Patrick DL, Convery K, Keller RB, Singer DE. The Quebec Task Force classification for Spinal Disorders and the severity, treatment, and outcomes of sciatica and lumbar spinal stenosis. Loisel P, Vachon B, Lemaire J, Durand MJ, Poitras S, Stock S, Tremblay C.
Discriminative and predictive validity assessment of the quebec task force classification. Hill JC, Konstantinou K, Egbewale BE, Dunn KM, Lewis M, van der Windt D.
Clinical outcomes among low back pain consulters with referred leg pain in primary care. Nyiendo J, Haas M, Goldberg B, Sexton G.
Konstantinou K, Hider SL, Jordan JL, Lewis M, Dunn KM, Hay EM. The impact of low back-related leg pain on outcomes as compared with low back pain alone: a systematic review of the literature. Manniche C, Asmussen K, Lauritsen B, Vinterberg H, Kreiner S, Jordan A. Low Back Pain Rating scale: validation of a tool for assessment of low back pain. Barakatt ET, Romano PS, Riddle DL, Beckett LA. The Reliability of Maitland's Irritability Judgments in Patients with Low Back Pain. Albert HB, Jensen AM, Dahl D, Rasmussen MN. Managing missing scores on the Roland Morris Disability Questionnaire. Spitzer RL, Williams JB, Kroenke K, Linzer M, deGruy FV III, Hahn SR, Brody D.
Utility of a new procedure for diagnosing mental disorders in primary care. The PRIME-MD 1000 study. Beck AT, Ward CH, Mendelson M, Mock J, Erbaugh J.
Bech P, Rasmussen NA, Olsen LR, Noerholm V, Abildgaard W.
The sensitivity and specificity of the Major Depression Inventory, using the Present State Examination as the index of diagnostic validity. Waddell G, Newton M, Henderson I, Somerville D, Main CJ. A Fear-Avoidance Beliefs Questionnaire (FABQ) and the role of fear- avoidance beliefs in chronic low back pain and disability. Rabin R, de Charro F.
EQ-5D: a measure of health status from the EuroQol Group. Kamper SJ, Ostelo RW, Knol DL, Maher CG, de Vet HC, Hancock MJ. Global Perceived Effect scales provided reliable assessments of health transition in people with musculoskeletal disorders, but ratings are strongly influenced by current status. Verkerk K, Luijsterburg PA, Miedema HS, Pool-Goudzwaard A, Koes BW. Prognostic factors for recovery in chronic nonspecific low back pain: a systematic review. Hayden JA, Cote P, Steenstra IA, Bombardier C, Group Q-LW. Identifying phases of investigation helps planning, appraising, and applying the results of explanatory prognosis studies. Hill JC, Whitehurst DG, Lewis M, et al.